Mountain Sky Media is proud to announce the release of a new single by the Urban Monroes entitled “Hole in My Heart” which will appear on Acoustic Rainbow Bluegrass Sampler #3. Kentucky’s Acoustic Rainbow samplers have continued a proud tradition releasing 41 roots radio compilations. 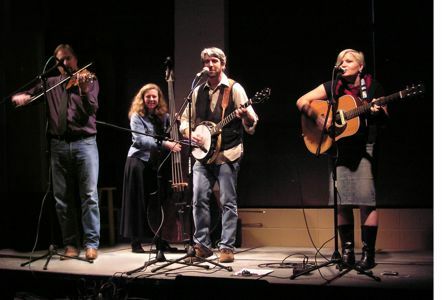 Recently they expanded their repertoire to include a sampler of bluegrass, old time and mountain music with distribution to over 800 radio stations world-wide and includes such artists as Alison Krauss, Steve Martin, the Grascals, Dolly Parton, Doyle Lawson and many others. /MtnSkyMedia/ It's been a while since there has been a general Urban Monroes update, so this 73 degree, sunny, Pacific Northwest summer afternoon seems like the perfect time to replenish that dearth of information. In late May the band's new CD, Pavement and Pathways, was released on Mountain Sky Media. The CD had been preceded by three single releases on Kentucky's Poetman Records' radio samplers, so the project had already been making plenty of radio traction starting last October, long before the official release. Thanks to many DJ's adding us to their playlists with some playing every cut on consecutive weeks and others having it in high rotation, the Urban Monroes appeared on numerous radio charts with several #1 positions.